Jack Ma knows artificial intelligence will change the world. The Alibaba founder and chairman doesn't think we should be scared. But he does think we should be prepared for major disruptions to the job market. "In the last 200 years, manufacturing (has brought) jobs. 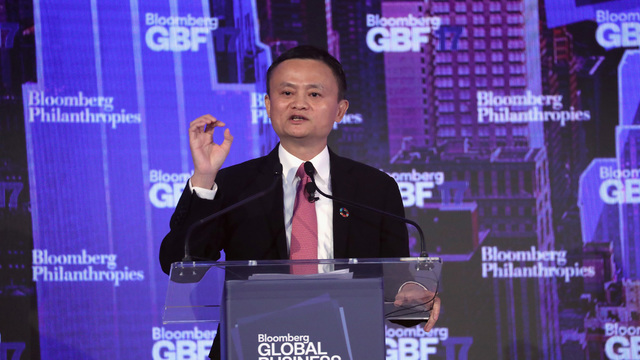 But today -- because of the artificial intelligence, because of the robots -- manufacturing is no longer the main engine of creating jobs," Ma said Wednesday in a speech at the Bloomberg Global Business Forum in New York City. Moving forward, Ma said he believes the service industry will be the largest engine of job creation. Ma's stance is starkly different from the economic vision espoused President Donald Trump, who campaigned on an "America First" populist agenda and has repeatedly made promises to restore U.S. manufacturing jobs. "Talking about manufacturing, we should not be talking Made in China, Made in America," Ma said. "It's going to be 'Made in Internet.'" But Ma sees a major obstacle: He doesn't believe the world's current approach to education properly prepares today's youth for the realities of tomorrow's work. "The way we teach ... is going to be making our kids [lose] jobs [in] the next 30 years," he said. He noted that when it comes to tasks like calculation, machines will always "do better." The key to keeping human workers relevant will be emphasizing imagination, according to Ma. "We have to teach our kids to be very, very innovative, very creative," he said. "In this way, we can create jobs for our own kids." When it comes to artificial intelligence, Ma positions himself a realist -- but also as an optimist. "The new technology will destroy a lot of jobs. But it will also create a lot of jobs," he said. "The question is whether we are ready and whether we are qualified for these new jobs." In the meantime, there shouldn't be widespread anxiety about a war between humans and machines, Ma said. Computers will never have mastery over "wisdom" or "love," giving human a perpetual advantage. "Human beings should have the self-confidence," he said. "Human being(s) have the wisdom. Machine(s do) not have the wisdom." It's a different view of artificial intelligence than the one promoted by Tesla CEO Elon Musk. Earlier this month, Musk tweeted that he believes AI will cause World War III as nations compete over the technology. Musk has long warned about the risks of AI. He signed a letter in August asking the United Nations to ban autonomous weapons and now heads the startup Neuralink, which is working to connect the human brain to computers. Musk figures that since nobody is heeding his warnings about AI, he may as well develop the technology in a way that will benefit society. Ma's understanding of the future -- particularly the future of human conflict -- offers up a bit more hope. "I'm optimistic -- positive -- for the future for the technology," he said. "But we also have to be very, very careful. The first technology revolution caused World War I. Second technology revolution caused World War II. Now, we're in the third technology revolution. The World War III should be against poverty, disease and environment pollutions."